- In bowl, add the all purpose flour, salt and oil and mix well. - Add water (little at a time) to knead the dough. - Keep kneading until you get a semi stiff dough, cover it with a damp cloth and keep it aside. - In a another bowl add chicken means, onions, garlics, coriander leaves, soya sauce, salt and oil, mix well. Take a small portion of the dough and using a rolling pin, roll out the dough into a small disc. - While rolling, make sure that it is slightly thinner at the edges and thick at the centre. - Place the stuffing at the centre and wet the edges with water. - Fold the edges towards the centre similar to the method of making modak. - Boil enough water in a momo steamer or large container and place a strainer over it and also brush it slightly with oil. 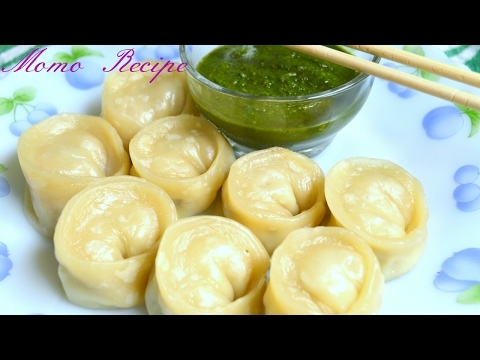 Place the momos on it and close the lid. - Let them steam for about 10 - 12 minutes.